With a spot in the 1999 ALCS on the line against the Red Sox, the Cleveland Indians decided to take their chances with Troy O'Leary instead of Nomar Garciaparra - twice. Both times, O'Leary made the Indians pay for walking Garciaparra to get to him. O'Leary hit two home runs, one a grand slam and the other a three-run shot, to power the Red Sox on to the next round. "It's been like that all year because of the player he is," O'Leary told The Washington Post. "Sometimes, I respond. Sometimes, I don't. Tonight was a good night." O'Leary responded in his seventh season in the majors and perhaps his best season. He hit a career high 28 home runs for the Red Sox that year, while hitting .280. O'Leary went on to play in a total of 11 big league campaigns, playing his last games in 2003 with the Cubs. 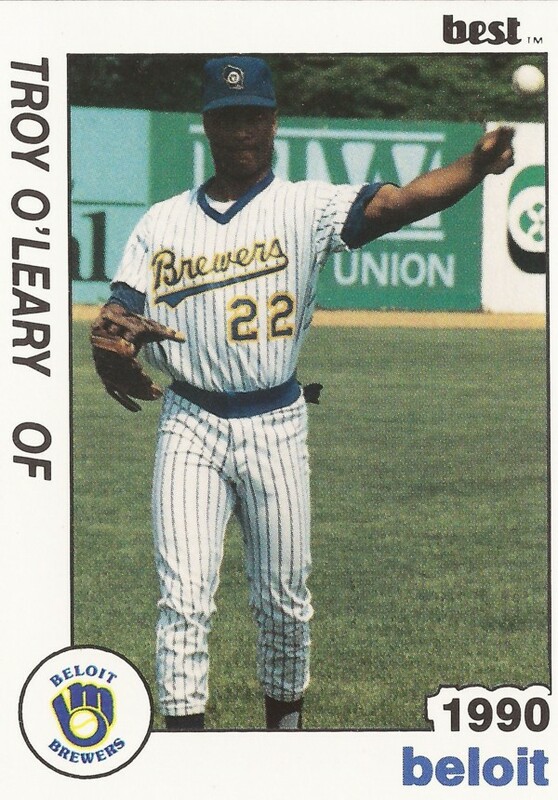 O'Leary's career began in 1987, taken by the Brewers in the 13th round out of Cypress High School in California. O'Leary started with the Brewers at rookie Helena. He played his first two seasons there and part of the third. He made high-A Stockton in his fifth season, then AA El Paso in his sixth. He played well enough at El Paso to win league MVP honors. He made AAA New Orleans in 1993 and debuted in Milwaukee that May. After his first brief stint in the bigs, New Orleans manager Chris Bando told The Los Angeles Times he expected O'Leary to make the bigs and make a home there. "He just keeps getting better and better," Bando told The Times. "When he gets up there and gets the chance to play every day for a while, we will not see Troy O'Leary in the minor leagues again." 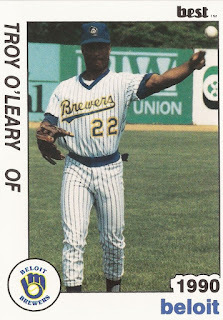 O'Leary got into 19 games for Milwaukee that year and another 27 games in 1994. He then became a major league regular with the Red Sox. He moved to Boston as the club selected him off waivers. He promptly played in 112 games for the Red Sox in 1995. He hit 10 home runs and ended with an average of .308. As he caught fire that summer, reporters kept asking O'Leary about his past time in Milwaukee, he told The Times. "They didn't give me a shot. They should have at least given me a shot," O'Leary told The Times. "They told me I needed more power. They said I couldn't play defense. They said I didn't have an arm. Whatever they thought was wrong is why I'm out of there and doing well here." O'Leary played with the Red Sox for seven seasons. He hit .309 in 1997 and more than 20 home runs in 1998 and 1999. He also hit those two home runs in Game 5 of the 1999 ALDS. He played with the Expos in 2002 and the Cubs in 2003. He got into 93 games for the Cubs in 2003. O'Leary played in two more seasons, 2004 in Korea and 2005 in Mexico, ending his career.